See early tampons and a list of tampons on this site - at least the ones I've cataloged. soft-cover book, 48 pages, 1986, U.S.A.
Company/corporate history of Tambrands, maker of Tampax menstrual tampons, sanitary napkins, Draghi cancer detection tampons, etc. I thank the former Tambrands for donating the book! Below: P. 33. 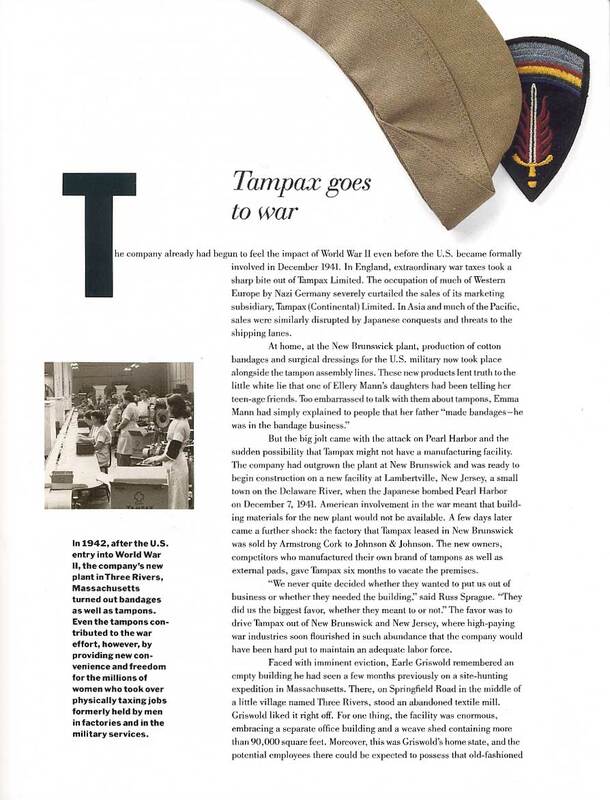 Section 4: Tampax goes to war. Competitor Johnson & Johnson forces Tampax out of its building. Kotex advertised World-War II-related themes. "Tampax tampons invites you to meet 1969's beautiful sales force,"